The Grade 3, $150,000 Mineshaft Handicap features an intriguing trio entered from last year’s Derby trail. Graded stakes winners Quip, Flameaway and Lone Sailor will each make their 4-year-old debuts going 1 1/16 miles on the main track. Quip opened his sophomore season in last year’s Tampa Bay Derby (G2), defeating Flameaway before finishing second in the Arkansas Derby (G1). Though he had enough points for the Kentucky Derby, connections opted to wait for the Preakness Stakes, in which Quip finished eighth in the fog and rain. The Mineshaft marks his first race back. After Tampa, Flameaway ran second in Keeneland's Blue Grass (G2) and secured his spot in the Kentucky Derby. He finished 13th the first Saturday of May and was second later that summer in the Jim Dandy (G2). Following Smarty Jones (G3) at Parx late August, Flameaway was found to have a cracked rib and received time off. Lone Sailor found his best stride the latter half of his 3-year-old season. While a runner-up finish in the Louisiana Derby (G2) sent him to the Kentucky Derby and Preakness, he finished off the board in the classics. But the colt continued on, placing in three graded stakes including the Haskell (G1) before winning the Oklahoma Derby (G3). 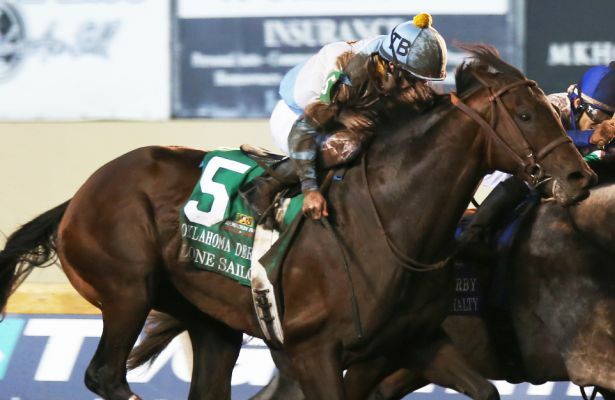 The Tom Amoss trainee finished his season with a sixth-place effort in the Breeders' Cup Classic. The Grade 2, $200,000 Rachel Alexandra Stakes plays host to a field of talented 3-year-old fillies led by Needs Supervision and Positive Spirit, both last out stakes winners. Serengeti Empress will also be making her first start of the year. Needs Supervision rides a three-race win streak into the Rachel Alexandra. After breaking her maiden at Laurel Park and impressing in a Churchill Downs allowance optional claiming in November, big-name connections became interested. Howling Pigeon Farms LLC purchased her for $55,000 as a 2-year-old, but Gary Barber, Wachtel Stable and Madaket Stables LLC bought in after a five-length romp under the Twin Spires. Needs Supervision then won the Silverbulletday at Fair Grounds with ease. Positive Spirit, the half-sister to 2017 Kentucky Derby winner Always Dreaming, will be making her 3-year-old debut in the Rachel Alexandra. She broke her maiden in November at Churchill Downs and followed that race with a 10 ½-length romp in the Demoiselle (G2) at Aqueduct. Serengeti Empress drew attention at 2 when she won the Ellis Park Debutante by 13 ½ lengths, then followed up with a 19 ½-length victory in the Pocahontas (G2) at Churchill Downs. She sat just behind Jaywalk in the Breeders’ Cup Juvenile Fillies but faded to seventh as Jaywalk went on to win and lock up a championship. The one to beat in Fair Grounds' Risen Star Stakes is War of Will, who is looking to extend his win streak following his Lecomte (G3) victory. The 5-2 morning line favorite, who is Grade 1-placed on turf, has run two big performances on the dirt. He broke his maiden in the slop at Churchill Downs before backing up that performance in the Lecomte. War of Will, who likes to be forwardly placed, drew post 14, though trainer Mark Casse expects him to break quick and sit close to the pace. Though War of Will showed plenty of talent on the turf, he has shined so far on the dirt. His geared down five-length maiden win was less than a fifth of a second slower than the Kentucky Jockey Club (G2), and he was clear by four lengths in the Lecomte. At Golden Gate Fields on Saturday, Anothertwistafate will face Southern California invaders in the $100,000 El Camino Real Derby going 1 1/8 miles. The local trainee last drew off by five in a one-mile allowance Jan. 4, which followed a four-length maiden win around two turns about a month earlier. Doug O’Neill’s The Creep and Weekly Call, Jerry Hollendorfer’s More Ice and Keith Desormeaux’s Knight’s Cross are all possible to ship north for the race, which is the only Kentucky Derby prep at Golden Gate Fields. This is the first year the El Camino Real Derby also offers an automatic berth into the Preakness Stakes. In Monday’s Grade 3, $500,000 Southwest Stakes, Smarty Jones winner Gray Attempt will stretch out to 1 1/16 miles for the first time in hopes of extending his win streak to four. After breaking his maiden, Gray Attempt won the Sugar Bowl sprinting at Fair Grounds, then raced two turns for the first time in the one-mile Smarty Jones at Oaklawn Park. All three victories came on the lead. Multiple Grade 1 winner Paradise Woods is set to make her 5-year-old debut in Saturday’s Grade 2, $250,000 Santa Monica Stakes going seven furlongs at Santa Anita. She has been away since July and in the meantime was transferred from trainer Richard Mandella to John Shirreffs. Paradise Woods won the Santa Anita Oaks (G1) two years ago by 11 ¾ lengths before disappointing in the Kentucky Oaks. She also won the Zenyatta (G1) that season and ran third in the Breeders’ Cup Distaff. From three starts in 2018, she finished on the board once when a distant third in the Beholder Mile (G1). Bob Baffert also has three fillies that are possible to start in the Santa Monica: Dream Tree, Marley’s Freedom and Emboldened. Grade 1 winner Dream Tree was unbeaten in five starts until she finished eighth in the La Brea (G1) Dec. 26, her first race back since missing the Breeders’ Cup Filly & Mare Sprint with an entrapped epiglottis. Marley’s Freedom, also a Grade 1 winner, finished second in the Santa Monica a year ago and shipped to Aqueduct to win the Go for Wand (G3) Dec. 1. Lightly raced Emboldened, who won the Angel’s Flight in May, returned in the La Brea to run third. Carrick, the upset Secretariat Stakes (G1) winner last year at Arlington Park, will receive a class break at Fair Grounds on Saturday when he contests Race 8, a $44,000 allowance optional claiming event at about 1 1/16 miles on the turf. The Giant’s Causeway colt will be looking for a confidence booster following two off-the-board finishes to round out 2018. Carrick began his career in maiden claiming and won the Secretariat only three starts later. At 38-1, he ran down the favorite Analyze It and won by a neck. He then faced older horses in the Joe Hirsch Turf Classic (G1), which awarded the winner an automatic berth into the Breeders’ Cup Turf, and finished sixth over a soft going. Carrick found firm turf in Del Mar’s Hollywood Derby (G1) and took over heading into the homestretch before fading to fifth.